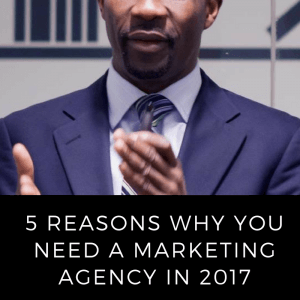 As I communicate regularly with small business owners and entrepreneurs across the land there is a sense that in today’s world the role of a Marketing agency is obsolete. Creating good marketing material is an art and having a resounding copy to complement the design is paramount for great customer/client engagements. However this is so far from the truth, today you need a marketing agency more than before in my opinion. What small business owners and entrepreneurs fail to understand is the wealth of knowledge that a Marketing agency can deploy on their ventures. They can do their marketing on their own and my question always, is this the best way for you to spend your time? For the record marketing is more than just posting material on different social media platforms and not actually understanding the metrics for all their efforts. Marketing agency understands all the metrics which they will in general share with their clients and in some case can predict how customers will behave on certain platforms. For small business owners and entrepreneurs my advice is that you should not take the DIY (Do It Yourself) mentally towards your marketing as this may damage your brand in the eyes of your potential clients/customer. Marketing agency has an in-depth knowledge of how to use all the marketing channels and tools to help your businesses grow at a rapid rate. It can assist small business owners and entrepreneurs to develop a comprehensive marketing plan, helping to market their businesses better and gain a greater return on their marketing spent. Agency has access to current market data that will underpin all their recommendations to the small business owners and entrepreneurs. Agencies are staffed with professionals in their filed and spend a great deal of time exploring how to increase the return for their marketing spend. Small business owners and entrepreneurs can use a marketing agency as a sounding board for all their marketing ideas. It will help their business extremely. Marketing agencies come in all shapes and forms form the multinationals to small unique boutiques styled agency. No matter the size they all have great insight to which marketing channels or techniques that can get the small business owners and entrepreneurs the best result in the marketplace. As technology is advancing so is all the staff in the marketing agency because they train regularly to up skill themselves. Some training courses are offered by the endorsing body that the marketing agency belongs to such as the Charter Institute of Marketing or The Marketing society. Marketing agencies are worth their weight in Gold just find a good one and see how they can assist you in growing your business/venture. I am a great believer that just like a good accountant can save you money on your taxes, so could marketing agencies help you to become more profitable. Working with a marketing agency will assist you and your company to approach your marketing efforts with better understand and great confidence.